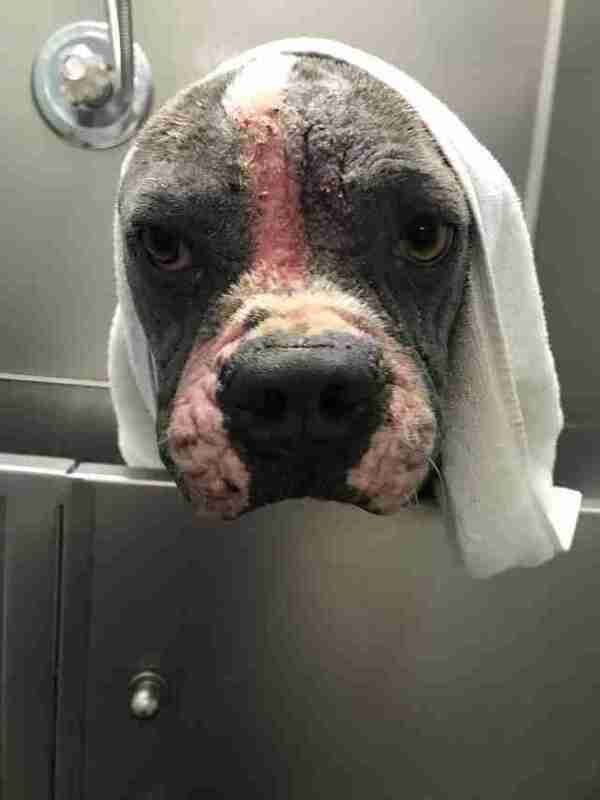 After Meatloaf was abandoned and left to fend for himself, he was hit by a car while wandering the streets of Florida, and the person who hit him quickly contacted animal control. 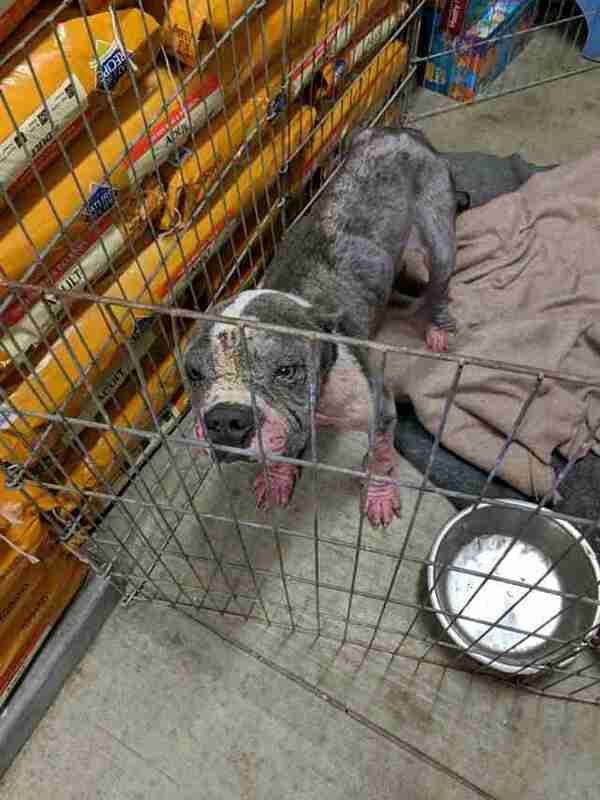 Meatloaf was soon pulled by Rescue Animals In Need (RAIN), who immediately realized from his condition and his demeanor that the poor dog had been through a whole lot more than just a car accident. 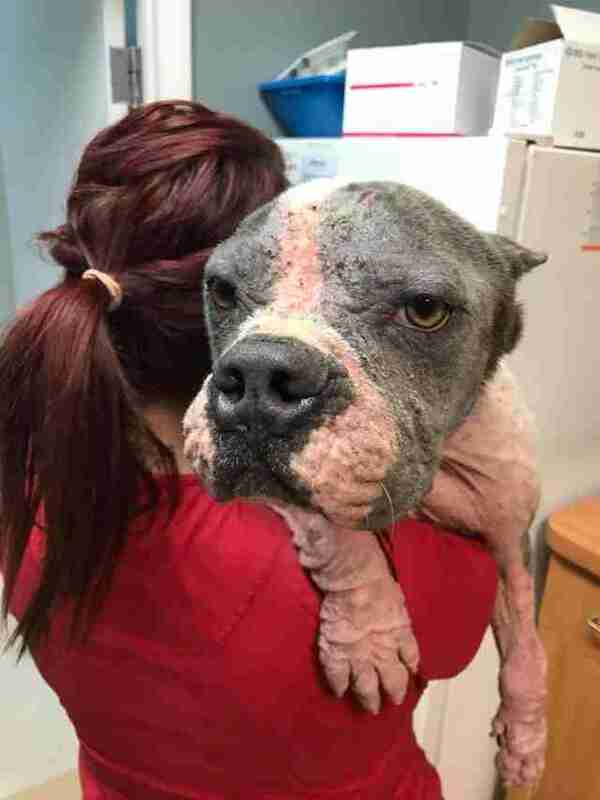 When Meatloaf was first taken in by the rescue, he was covered in skin infections and mange, suffered from double ear infections and was around 20 pounds underweight. He was terrified of everything, and based on his injuries and his obvious neglect, his rescuers assumed he was probably used as a bait dog for dogfighting at some point. Despite his awful past and intense fears, Meatloaf was thrilled to finally be safe, and even though all of his new friends at the rescue could tell he was scared, he still never stopped wagging his tail, and seemed to be desperately trying to overcome his anxiety. 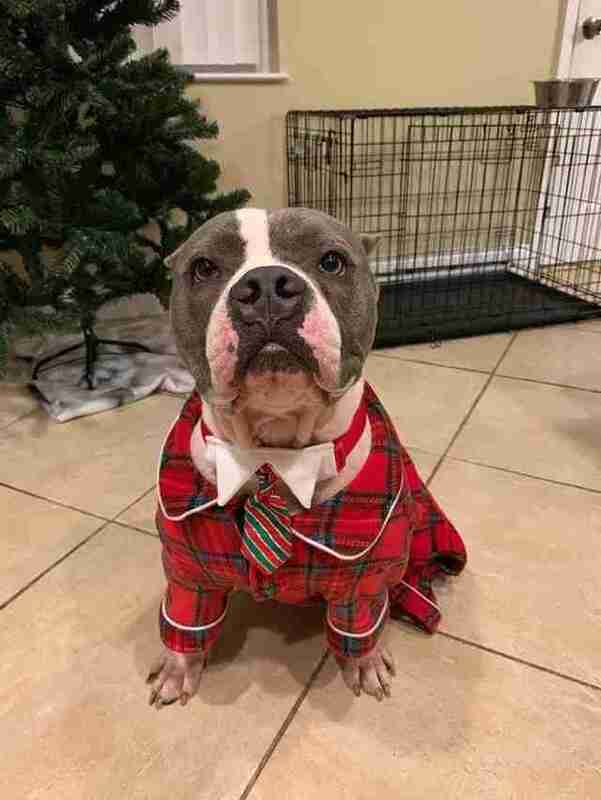 Meatloaf was placed in a foster home while he healed from his many ailments, and eventually, it was time to start searching for his forever home. 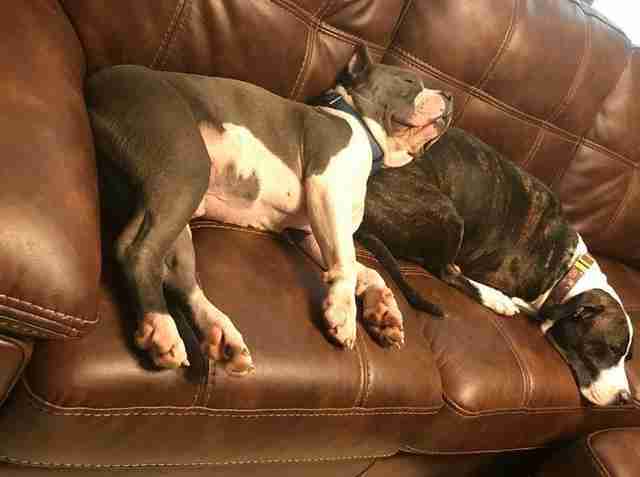 His foster mom met a few prospective adopters, but none of them felt like quite the right fit. After everything he’d been through, Meatloaf’s foster mom desperately wanted to find him the perfect family where he could thrive. She was worried she would never find a family she was completely comfortable handing him over to — until she met Brittney Strugala. 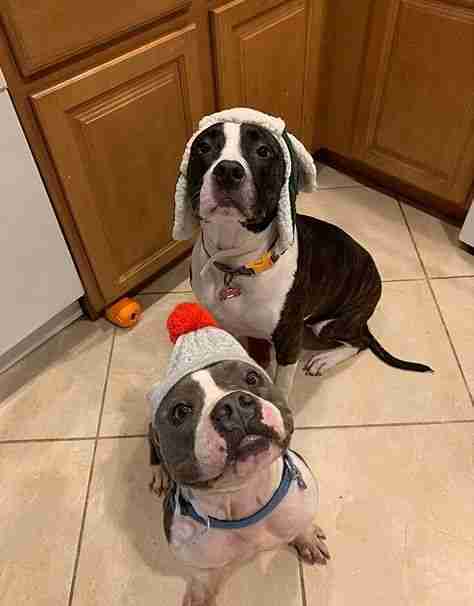 Strugala was helping her best friend look for a dog to adopt, and when she came across Meatloaf’s picture, she suddenly had the strongest feeling that she needed to adopt him herself; that he was meant to be her dog. She and her fiancé had been considering adopting a friend for their other pit bull, Sky, and Strugala knew in her heart that Meatloaf was the dog they had been waiting for. The only problem was the couple’s apartment management wouldn’t allow them to have more than one dog — and so they decided to move. 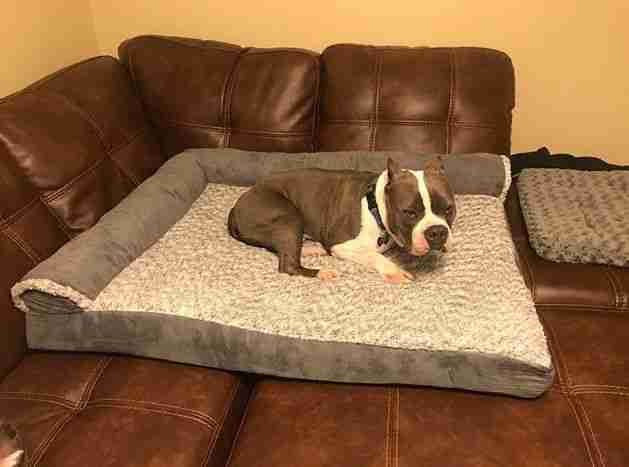 As soon as their living situation changed, the couple jumped at the chance to welcome Meatloaf into their family — and only five days after they moved into their new place, Meatloaf arrived in his new home. Even though most of Meatloaf’s ailments were healed by the time he was adopted, he was still pretty anxious — but his new family was determined to help him through it, even though they knew it could be a long road. “I knew that he would be a lot of work and I wanted to be a part of it all the way,” Strugala said. Meatloaf loved his new family from the very beginning, and despite his fears of little things like sudden noises, he seemed immediately comfortable in his new home and trusted his new family members — especially his dog sister Sky. With Sky’s help, Meatloaf has slowly but surely become less afraid of things, and is able to handle whatever comes his way as long as he has her by his side. Now, Meatloaf is the happiest, goofiest pit bull around, and could not love his new life more. He absolutely adores cuddling with his parents, and throws little tantrums every time they have to leave for work. He follows his sister Sky around everywhere, and seems to have finally accepted that as long as he has his family, he’ll never have to feel scared ever again.